Parliament, alas, is playing a diminishing role in influencing the management of national affairs: yet it remains an effective barometer of the prevailing political climate. So when that climate is as confrontationist, divisive and polarised as at present, it is inevitable that the legislature is also subjected to turbulent buffeting. It would be schizophrenic to expect legislators to conduct themselves very differently in the House from what they do during their bread-and-butter politicking. Against this unhappy yet realistic background, the Vice-President’s suggestion for a consensus-based code of conduct for parliamentary functioning equates with merely trying to suppress the symptoms, not remedy the underlying malaise. 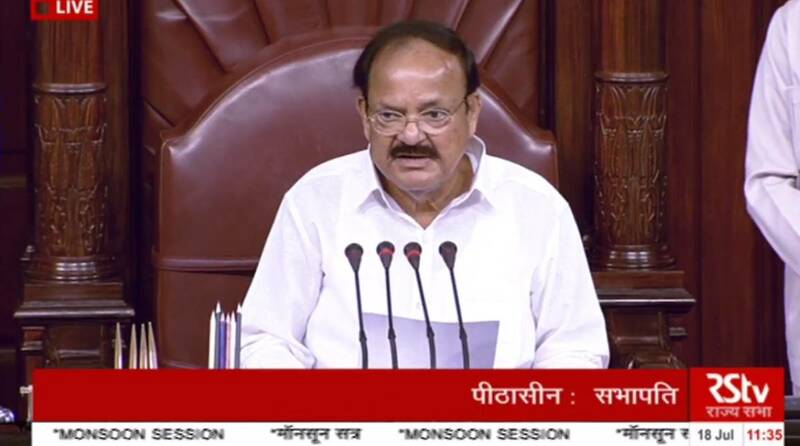 It is also apparent that after assuming the Chair in the Rajya Sabha, Mr M Venkaiaih Naidu, has opted to overlook what happened regularly when he spoke from the floor ~ uproar in Parliament is not an overnight development. The Prime Minister may be excused for taking yet another dig at the Opposition when endorsing the call from the Vice-President at a function to mark his “progress report” (Mr Naidu’s) after a year as Chairman of the Rajya Sabha: Mr Narendra Modi is not a creature of Parliament, unfamiliar with the intricacies of recent precedent setting complications ~ but that alibi would also not suffice for the Congress’ plea that its president was little more than a schoolboy in 1984, hence unaware of the carnage in the Capital at the time. Rather than only advocate better behaviour, Mr Naidu would be performing a national service if he attempted to defuse the powder keg on which Indian politics is perched ~ the fuse burning shorter as 2019 approaches. Little purpose would be served in trying to apportion blame for who is responsible for the present mess. Rajiv Gandhi’s desire to toss the Marxists into the Bay of Bengal was born of the same sentiment that has just seen the son of a BJP legislator in Madhya Pradesh being arrested for talking of taking the life of Jyotiraditya Scindia. In his own way Mr Modi has contributed to that logjam: his contention that discipline is slammed as being “autocratic” speaks volumes for the lack of effort to work towards consensus: his praise for the Vice-President’s sense of punctuality serves as a reminder of the claims that during the Emergency the trains ran on time, and clerks in government offices were at their desks as scheduled. Regimentation and democracy do not go hand in hand, give-and-take are the essence of the latter. Unfortunately the Presiding Officers in Parliament are overly-influenced by the numbers thrown up in a Lok Sabha poll ~ note how the Upper House is being short-changed by the Speaker determining several legislative proposals to be “money bills”. Mr Venkaiah Naidu is not to be faulted for desiring more cordiality in Parliament, but that would flow when politics is cordial too ~ here too it is time to emulate Atal Behari Vajpayee.